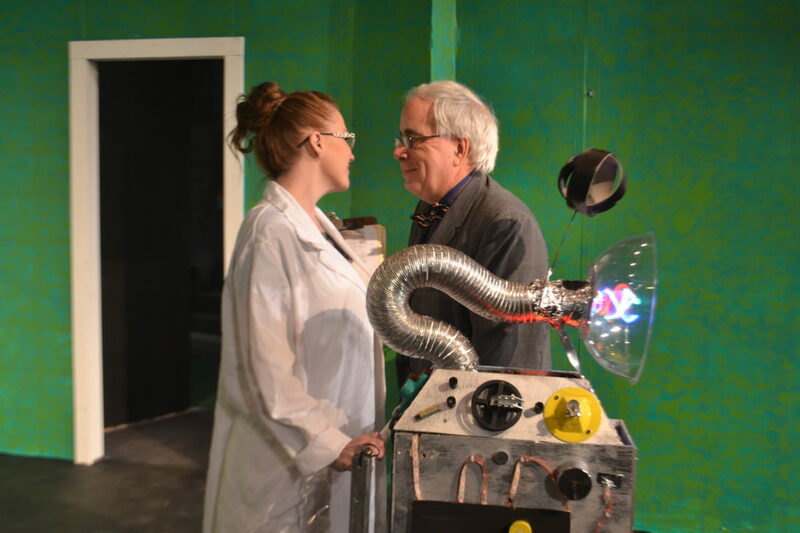 With a new, updated script, the Mid-Ohio Valley Players are bringing a stage version of the classic, and in some ways cutting-edge, comedy to the stage in Marietta. The original premise – a bumbling secret agent in an incompetent network set against a farcically threatening opponent – is preserved in the new production, while the gags and jokes are brought up to date and the strictly 1960s references are removed. The director believes it’s comedy for anyone, even those born well after the original series went into the broadcast museums. Assistant director J.R. Wells said the humor holds up. “Its not dated, this show doesn’t have any of those problems, like references the audience won’t get,” he said. It’s Polan’s first run at directing, and she said it’s been daunting. The cast, at 27 parts, is enormous for the MVOP. Props were another challenge, but Polan said creative thinking and connections got that part done. Her grandfather, for instance is a collector. “A lot of it is about getting the timing exactly right,” she said. “You can’t wait too long or make it too short. “There’s a saying in the theater that death is easy, comedy is hard,” she said, explaining that it’s easier on stage to move people’s emotions than it is to make them laugh. Sarah Rose Drake has had an eclectic series of roles as an actress, ranging from a vampire to a part in “Midsummer Night’s Dream”. She said she was immediately drawn to the role of Agent 99 in Get Smart when it was posted. “I was a fan of the TV show from the 1960s and the movie (in 2008, starring Steve Carrell). It looked like it would be fun to play,” she said. She said all the cast will put their own stamp on the stage roles, but she said she’ll try to channel the Barbara Feldman type more than the Anne Hathaway portrayal. At 33, she’s in between the TV and movie generations. The storyline, she said, is similar to the first two episodes of the series’ first TV season. For the stage play, the plotline has Maxwell Smart and Agent 99 working to stop the sinister organization known as KAOS from blowing up the Statue of Liberty. “Agent Smart proceeds from one gigantic blunder to another in this ultimate spoof of all secret agent thrillers,” the MOVP program reads. Doug Reed, who plays Maxwell Smart, said timing is crucial for the main character. He spent hours watching Get Smart episodes. “In learning about the original production, I noticed that Don Adams drove a lot of the pacing and action, so a lot of the timing is going to be up to me, it’s 100 percent my game, but it’s not hard with such a talented and supportive cast,” he said. The play is a good fit for his interests. “Rehearsing is the key,” he said. Polan said an observant audience will uncover some hidden gems in the play. Tickets: In advance at movp.org, Marty’s Print Shop, 307 Third St.,Marietta- Washington County Convention and Visitors Bureau, 119 Greene St.